36½ (39½, 43½, 47½, 50½)" circumference at underarm. 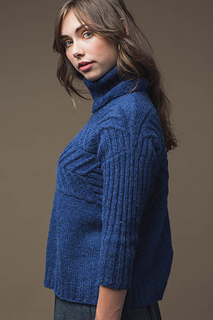 The Gardenio di Boboli Pullover is a dramatic cowl-neck sweater featuring unusual construction: the bold, graphic, cabled panel that forms the yoke of the sweater is worked sideways, whereas the stockinette body and ribbed sleeves are picked up from their respective edges and worked down. 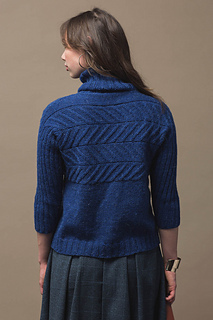 Diagonal cables grow out of 2x2 rib and provide an eye-catching but sophisticated texture. FINISHED SIZE 36½ (39½, 43½, 47½, 50½)“ circumference at underarm. 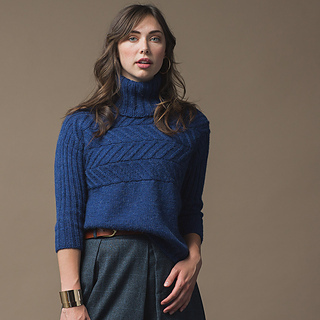 Pullover shown measures 39½”; modeled with 6” of positive ease. YARN Sugar Bush Yarns Rapture (50% Llama Soft, 50% superfine merino wool; 211 yd / 3½ oz): intense indigo, 5 (6, 6, 7, 7) skeins. NEEDLES Sizes 6 (4 mm), 7 (4.5 mm), and 8 (5 mm): 16” circular (cir). Size 7 (4.5 mm): 32” cir. Adjust needle size if necessary to obtain the correct gauge. GAUGE 26 sts and 26½ rows = 4” in cable patt on medium-size needle; 19 sts and 26½ rnds = 4” in St st on medium-size needle; 28½ sts and 26 rnds = 4” in k2, p2 rib on smallest needle.